The Globe and Mail had a great article this week on the health benefits of knitting. Take a moment to read it and keep on knitting! Wool N’ Things is pleased to announce the arrival of Rowan’s two new yarns for Spring 2016 – Softyak DK and Summerlite DK. Softyak DK is a perfect yarn to transition into the Spring & Summer seasons. Ideal for both knitting and crochet projects, Softyak DK is a blend of 76% Cotton, 9% Nylon and 15% Yak. The yak gives the yarn a super soft feel while the nylon provides strength. Softyak DK is available in a beautiful colour palette and we offer all in-store for $12.99/50 gram ball. Also available is the Rowan Softyak DK collection of 12 designs by Marie Wallin. Summerlite DK is a beautiful soft 100% cotton yarn. Available in a spectacular collection of colours ranging from soft pastels to spring/summer brights for $7.99/50 gram ball. 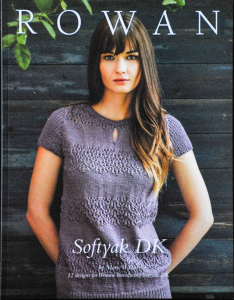 12 designs for Women, by Martin Storey, are now available in Rowan’s Summerlite DK book. New Spring Rowan Pattern Books Have Arrived! A beautiful collection of 36 versatile designs by some of our favorites including Lisa Richardson, Sarah Hatton, Gemma Atkinson, Martin Storey, Marie Wallin, Kaffe Fassett, Zandra Rhodes, Carlo Volpi, Amy Herzog, Heather Dixon and Cirilia Rose. Rowan offers 18 stunning Coastal inspired designs for both men and women, the history of the Guernsey, an interview with Rowan Designer Carlo Volpi and 18 vibrant designs for women inspired by Japan. Pick up your new Rowan Magazine now! The fourth book in this series offers 9 designs which can be knit with either Cotton Lustre or All Seasons Cotton. Designed by Gemma Atkinson, these patterns are offered in beautiful soft spring colours that will transition you into the season.